Victoria's only five star oceanfront resort. 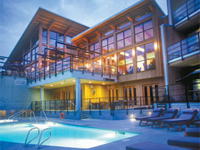 A contemporary westcoast Lodge reflecting the refinement of countless details. On a pristine inlet in the heart of wine country, close to the charming city of Victoria and only minutes to The Butchart Gardens. From every vantage point, the ocean views inspire us to respond to the elements. Join us.